F li g h t lin e Homebuilding Community Loses Two EAA has learned of the passing of two homebuilding notables. Michael "Mick" Myal, EAA 7978, the founder of Contact! magazine and a noted experimental aviation writer, passed away on November 12, 2012. Mick was known to thousands of homebuilders for attending countless air shows and from the books and magazine articles he published. Mick founded Contact! in 1990 and edited its ﬁrst 70 issues. View an online obituary for Mick here. Harry C. Riblett Jr., EAA 29576, passed away on December 23. Harry was an active homebuilder, but his most dedicated work was in researching airfoil designs, convinced that safer airfoils would save lives. His ﬁrst book, GA Airfoils: A Catalog of Airfoils for General Aviation Use, shows airfoils superior to the currently available NACA airfoils. Both GA Airfoils and his second book, Spin Resistant Airfoils, are currently being used by aircraft designers. View an online obituary for Harry here. EAA extends its deepest condolences to the families and many friends of Mick and Harry. 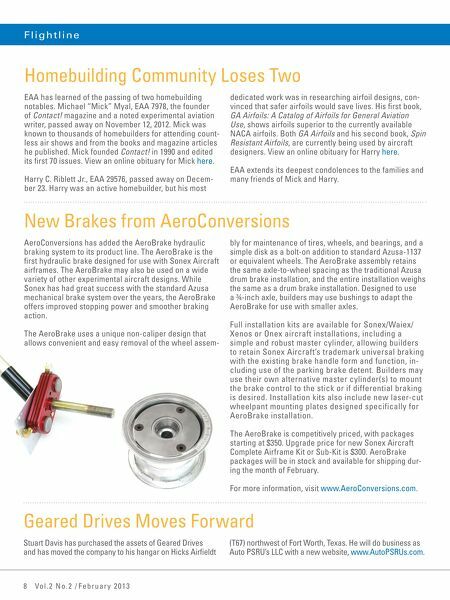 New Brakes from AeroConversions AeroConversions has added the AeroBrake hydraulic braking system to its product line. The AeroBrake is the ﬁrst hydraulic brake designed for use with Sonex Aircraft airframes. The AeroBrake may also be used on a wide variety of other experimental aircraft designs. While Sonex has had great success with the standard Azusa mechanical brake system over the years, the AeroBrake offers improved stopping power and smoother braking action. The AeroBrake uses a unique non-caliper design that allows convenient and easy removal of the wheel assem- bly for maintenance of tires, wheels, and bearings, and a simple disk as a bolt-on addition to standard Azusa-1137 or equivalent wheels. The AeroBrake assembly retains the same axle-to-wheel spacing as the traditional Azusa drum brake installation, and the entire installation weighs the same as a drum brake installation. Designed to use a ¾-inch axle, builders may use bushings to adapt the AeroBrake for use with smaller axles. Full installation kits are available for Sonex/Waiex/ Xenos or Onex aircraft installations, including a simple and robust master cylinder, allowing builders to retain Sonex Aircraft's trademark universal braking with the existing brake handle form and function, including use of the parking brake detent. Builders may use their own alternative master cylinder(s) to mount the brake control to the stick or if differential braking is desired. Installation kits also include new laser-cut wheelpant mounting plates designed specifically for AeroBrake installation. The AeroBrake is competitively priced, with packages starting at $350. 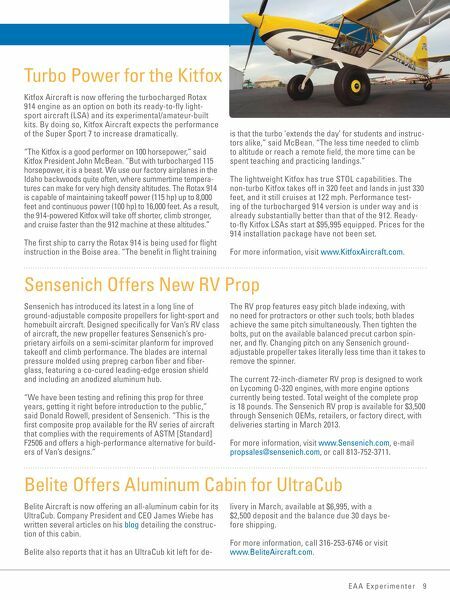 Upgrade price for new Sonex Aircraft Complete Airframe Kit or Sub-Kit is $300. AeroBrake packages will be in stock and available for shipping during the month of February. For more information, visit www.AeroConversions.com. Geared Drives Moves Forward Stuart Davis has purchased the assets of Geared Drives and has moved the company to his hangar on Hicks Airﬁeldt 8 Vol.2 No.2 / February 20 13 (T67) northwest of Fort Worth, Texas. He will do business as Auto PSRU's LLC with a new website, www.AutoPSRUs.com.